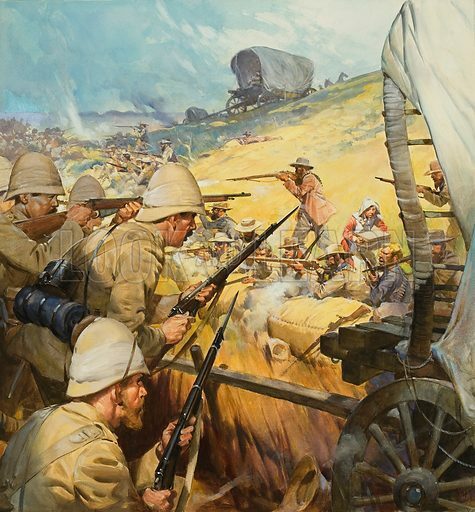 11 October marks the anniversary of the beginning of the Second Boer War between the British Empire and Dutch inhabitants of the South African Republic and the Orange Free State. Tensions from the earlier troubles in 1880-81 had simmered on, exacerbated by the botched Jameson Raid to ‘liberate’ Johannesburg in 1895. The Boers rearmed and war became inevitable. The war ended in 1902 with the signing of the Treaty of Vereeniging but only after the deaths of some 75,000. More pictures relating to the Boer War can be found here. Many more images of war through the ages can be found at the Look and Learn picture library. 11 October marks the anniversary of the birth of Henry John Heinz, the American food-products magnate. Born in Pittsburg, Pennsylvania, Heinz was one of eight children born of immigrant German parents. His interest in helping his mother with her vegetable patch developed into a business by the age of nine, selling horseradish sauce and vegetables. 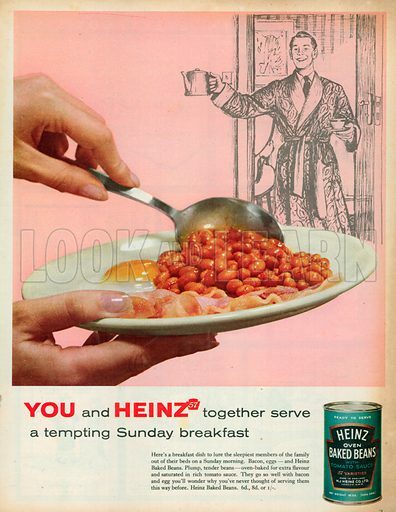 The Heinz company, founded in 1876, became famous for its “57 varieties”, a number chosen at random in 1896 by Heinz – the company marketed many more than 57 varieties of product by then. The company’s founder died in 1919. More pictures relating to Heinz can be found here. Many more images relating to food through the ages can be found at the Look and Learn picture library. 10 October marks the anniversary of the deadliest hurricane to strike in the Atlantic. 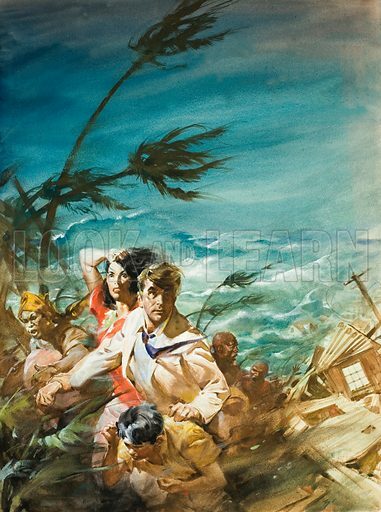 In 1780, Hurricane San Calixto, also known as the Great Hurricane of the Antilles, passed over the Lesser Antilles islands in the Caribbean, dashing the islands for a week before passing close to Puerto Rico and turning northeast. It caused untold damage and the deaths of over 27,500 people. Many more pictures relating to the weather can be found at the Look and Learn picture library. 10 October marks the anniversary of the opening of the Theatre Royal in Drury Lane, London, in 1812. This was the fourth theatre to open in the same location, the first dating back to 1663. It was destroyed by fire. The second, opened in 1674 was demolished in 1791 to make way for a third, which opened three years later but burned down in 1809. More pictures relating to the Theatre Royal can be found here. 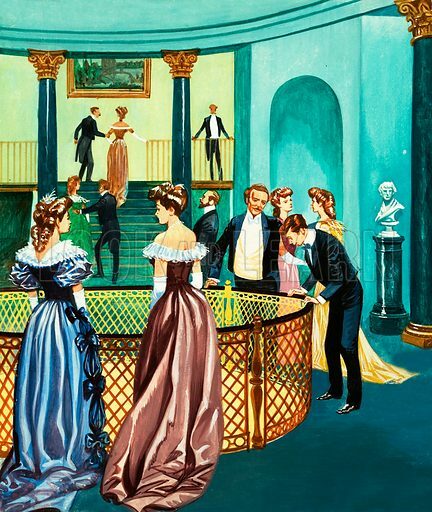 Many more images and illustrations relating to theatres through the ages can be found at the Look and Learn picture library. 9 October marks the anniversary of the beginning of the siege of Sebastopol in 1854. 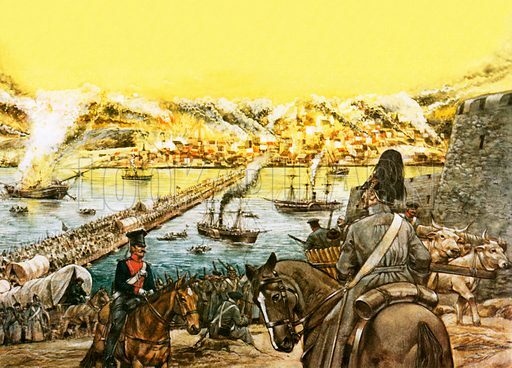 During the Crimean War, the city (sometimes known as Sevastopol) was surrounded by Allied (British, French and Turkish) troops and a long siege ensued. The British bombardment of the city finally paid off and an all-out assault in August 1855 took the city. More pictures relating to the siege of Sebastopol can be found here. Many more illustrations relating to the Crimean War can be found at the Look and Learn picture library. 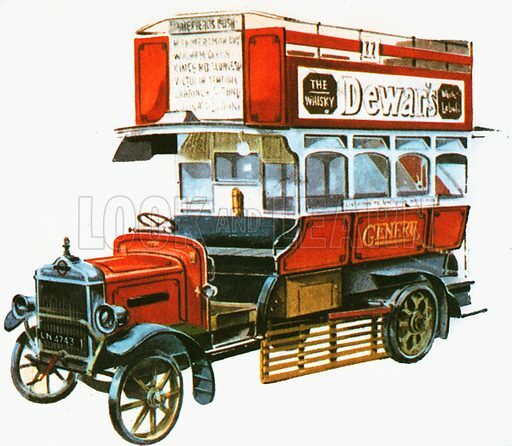 9 October marks the anniversary of the introduction of the petrol-driven motor bus to the streets of London in 1899. 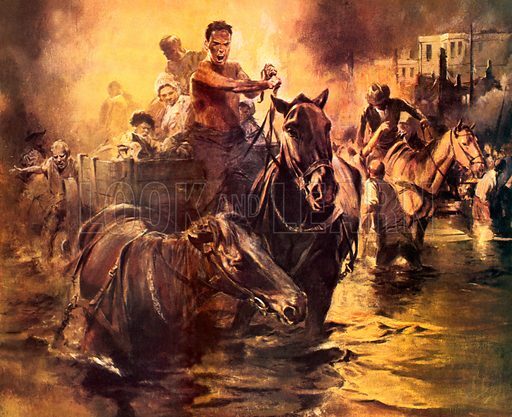 Before that, passengers of the London General Omnibus Company’s service were pulled by horses. More pictures of buses can be found here. Many more illustrations of transport through the ages can be found at the Look and Learn picture library. 8 October marks the anniversary of the Rainhill Trials in 1829. Not a trial for criminals… but for trains. When the Liverpool and Manchester Railway was almost complete, it was decided to bring together various steam engines and locomotives to see which would be best to pull their trains and an open contest was set up at Rainhill in Lancashire. 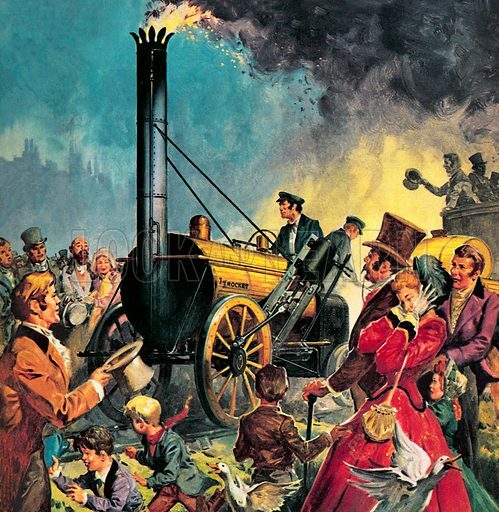 The winner was George Stephenson’s Rocket, which was the only locomotive to complete the trials. More pictures of Stephenson’s Rocket can be found here. Many more illustrations featuring trains throughout history can be found at the Look and Learn picture library. 8th October marks the anniversary of the beginning of the Great Chicago Fire in 1871. Starting in or near a small shed at 137 DeKoven Street, on a Sunday evening at 9 p.m., the fire spread rapidly. The fire burned itself out the next day as the wind died down and a light rain began to fall, but only after consuming an area of some 2,000 acres, including 17,500 buildings, leaving 90,000 homeless and an estimated 200-300 dead. The story that it was started by a cow kicking over a lantern published in the Chicago Republican was untrue, reporter Michael Ahern later admitting that he had made it up. More pictures of Chicago can be found here. Many more images of fires and firefighting can be found at the Look and Learn picture library. 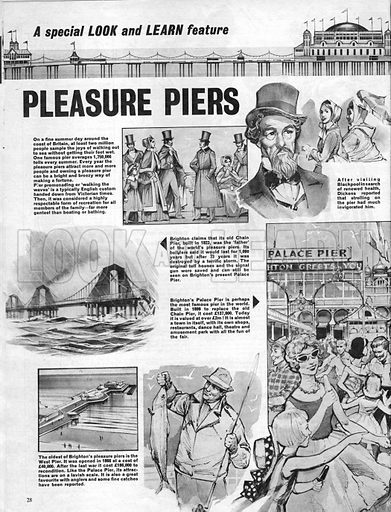 7 October marks the anniversary of a destructive fire on Southend Pier in 1959. A fire in the large wooden pavilion at the shore end trapped 300 visitors at the far end of the 1.5 mile-long pier. With no electricity to power the small railway that ran its length, those trapped by the blaze had to walk back and then climb down the pier structure to board boats. Many more pictures relating to the seaside and seaside attractions can be found at the Look and Learn picture library. 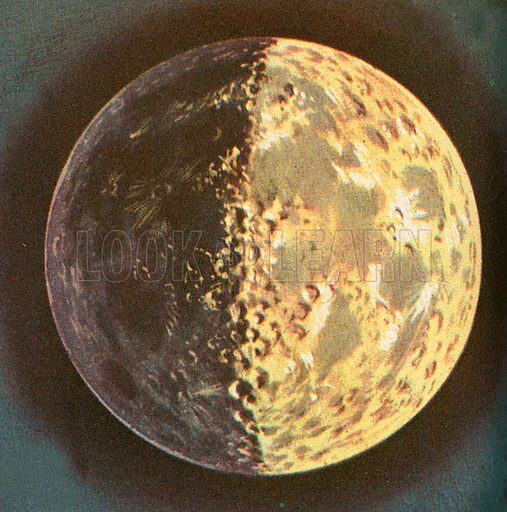 7 October marks the anniversary of the arrival of the first human satellite to reach our celestial satellite, The Moon. The Russian Lunik 3 mission was launched on 4 October 1959 and, three days later, began transmitting the first ever close-up photographs of the lunar surface. It also passed around the dark side of the Moon, allowing scientists to see the rocky, pitted surface – forever hidden because the Moon is in synchronous rotation with Earth – for the first time.